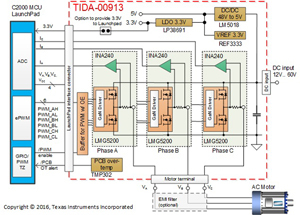 The TIDA-00913 reference design realizes a 48V/10A 3-phase GaN inverter with precision in-line shunt-based phase current sensing for accurate control of precision drives such as servo drives. One of the largest challenges with in-line shunt-based phase current sensing is the high common-mode voltage transients during PWM switching. The INA240 bi-directional current-sense amplifier overcomes this problem using enhanced PWM rejection. The reference design provides an output voltage from 0 to 3.3V, scaled to ±16.5A with 1.65V mid voltage for high phase-current accuracy over the entire temperature range. The TIDA-00913 offers a TI BoosterPack compatible interface to connect to a C2000 MCU LaunchPad™ development kit for easy performance evaluation. Wide input voltage range 12V to 60V 3-phase GaN inverter with 7Arms output current per phase and non-isolated phase current sensing. Precision in-line phase current sensing with 5mΩ shunt, ±16.5A full scale range and ±10A nominal range. High accuracy phase current sensing over the temperature range from -25°C to 85°C. Uncalibrated accuracy <±0.5%; calibrated accuracy <±0.1%. 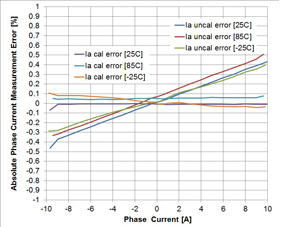 System cost reduction using a non-isolated current sense amplifier INA240 with superior AC common mode rejection operating up to PWM switching frequencies up to 100kHz. 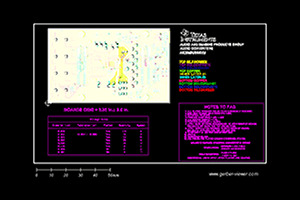 Reduced BOM and easy layout due to the INA240 bi-directional, zero-drift current sense amplifier that directly interfaces to a 3.3V ADC. TI BoosterPack compatible interface with 3.3V I/O for easy performance evaluation with a C2000 MCU LaunchPad™ development kit.